Once again courtesy by Evleaks we have some light over Sony’s one of upcoming product in MWC next weeks. 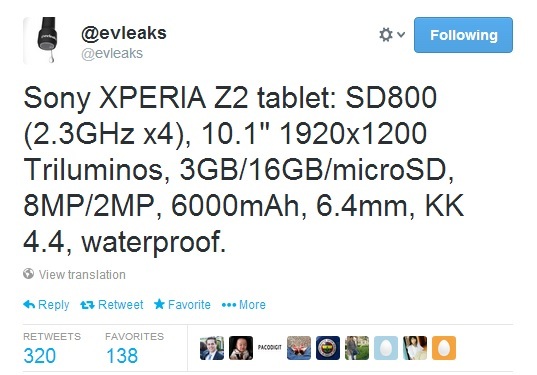 It’s a tablet possibly named XPERIA Z2, successor of nicely designed XPERIA Z tab. They also posted all the main specs of the tablet in their Twitter post. Everything is just as we expected from a high end tab is there including Sony exclusive sleek waterproof body. Z2 will be a 10.1-inch tab having 1920 X 1080 pixel display. There is also rumor that the tab will be lighter than iPad Air! Now lets see what we’ve found inside. There is a quad-core Snapdragon 800 SoC clocked at 2.3GHz CPU powering all the little beasts inside with the help of 3GB RAM. The internal memory is 16GB with a microSD card slot, 8 megapixel rear camera and 2 megapixel front camera, 6,000mAh battery, 6.4mm waterproof body and will run Android 4.4 KitKat. No launch date is available as of now but we might just see it at the MWC 2014 next week. Price update is also in the black so far.